As evidence of our all-encompassing culinary rapture, San Diego is home to TONS of monuments to progress and decency, also known as taco trucks. Purveying all that is righteous aboard some form of tortilla, it's hard to imagine a life devoid of these trucks, literal vehicles of strange meats and the bounties of the sea (including species that were once illegal to eat). Alas, there can only be 10 top taco trucks with perfect offerings in town as decided by us, so, in a decidedly particular and subjective order, here they are. You haven't tasted Tijuana street-style tacos until you've savored the buttery barnyard bliss of tripa (yes, that's grilled cow intestine). Parked aside one of San Diego’s great dives, Mr. D’s Cocktails, this truck is all that remains of a nearby strip mall brick-and-mortar that shuttered up a few years back. Now, you can grab $1.95 tacos with the classic TJ fixin's of diced onion, cilantro, and the occasional dash of avocado sauce (technically guacamole, but the word feels too lofty for this thin preparation) on top of tender lengua (tongue), cabeza (head meats), asada, tripa, and adobada. A solid 10 to kick off our list. 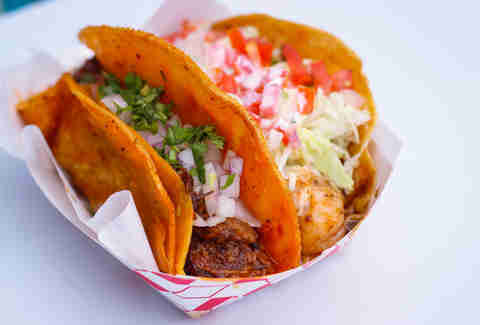 If you’re cool with the fact that Soylent Green is cephalopod, you’ll love Kiko’s spicy octo taco. The eight-legged Einstein of the sea is basked in chile oil before being served on a corn tortilla with grilled onion and a mix of half-melted white and yellow cheese. Treat yourself to a free cup of soup while you wait, but resist the urge to toss it back like a Jägerbomb and scorch your tongue in the process. OG fish tacos go for $1.75 all day long. Ah, birria. The Destroyer of Hangovers. The Jaliscan wonder dish. The alchemical stew of slow-cooked, coarsely chopped beef, abodo spices, and toasted chiles. In its taco incarnation, birria comes on a tortilla that has been dunked in the red broth and lightly crisped on the plancha. Garnish to taste with onion, cilantro, and plenty of lime. While you’re here, grab a taco cameron enchilado. 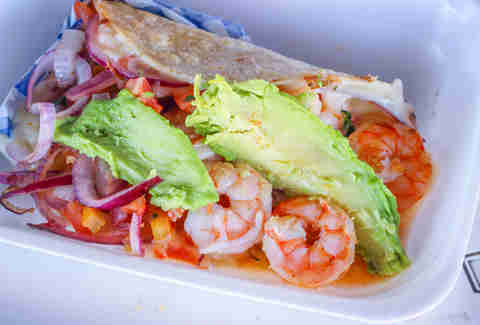 The Sinaloan staple is packed with grilled shrimp coated in garlic oil, melted white cheese, cabbage, tomatoes, onion, and avocado. There’s nothing better for a hot summer snack than a heaping, raw plate of aguachile. Sip on a complimentary consomé (a small seafood vegetable soup) and allow about 15 minutes for the lime juice to "cook" the raw shrimp into a white, gummy appearance. Best described as a spicy ceviche, aguachile is stacked high on a tostada with cucumber, onion, cilantro, and avocado slices. While the name literally means "chile water," don't hesitate to add some marinated onions and habaneros to the mix. If you're not sweating, you're not doing it right. 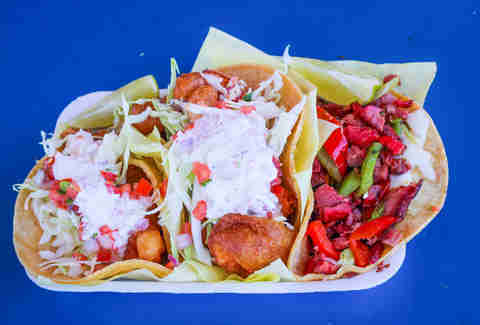 Who better to open up a mariscos truck than a local seafood distributor? Nine Seas’ mobile kitchen posts up in the Gala Foods -- er, Target Express -- parking lot and serves killer renditions of all the mariscos classics. Sample the spread with a $7 Baja Trio of Ensenada-style battered white fish (with shredded cabbage, tomato, onion, and crema), fried shrimp, and smoky marlin with grilled bells, tomato, celery, and melted cheese. Resist eating the marlin -- or as we like to call it, the bacon of the sea -- until last, as the fish and shrimp breading will go soggy if left alone for long. 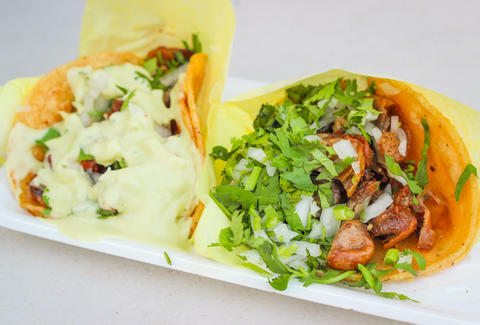 More rightly called a taco trailer than a truck, La Fachada might be the best spot in town for authentic TJ tacos and masa-based rarities such as huaraches, gorditas, mulitas, and sopes. Nothing is taboo on this menu loaded with offal oddities including buches (pork stomach), cabeza, and tripa. 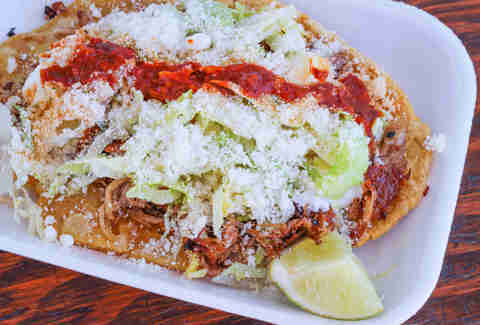 Named after a Mexican sandal, the huarache ($4.50) is an oval of pan-fried hominy dough piled with lettuce, cotija cheese, crema, and for our purposes, carnitas, or marinated and lard braised Michoacán-style shredded pork. Think of it as a Mexican pizza. Or don’t. Either way, be sure to squeeze plenty of lime on there to cut the fatty pig meats. Behold, the taco gobernador, the miracle of Mazatlán. It was in this coastal Sinaloan city that, as legend has it, Los Arcos restaurant first had the epiphany of combining shrimp and melted cheese on a taco to accommodate a visiting governor. These days, any mariscos joint worth its weight in oyster shells will offer this seaside standard, and Tijuana JR makes ‘em as good as any. The brined seabugs are topped with lightly grilled red onion, tomato, bells, and a few slices of avocado. Classic fish tacos go for a buck on Tuesdays. This popular destination in located in the parking lot of Fiesta Hall, which has an unfortunate propensity to blasting sappy rave tunes and reggaeton all day. You have been warned. Easily the most mobile kitchen on our list, Salt + Lime is a fairly new endeavor of Chef Julio Rodriguez, a graduate of Tijuana’s renowned Culinary Art School. Rodriguez puts a modern twist on Mexican standards by, for example, using adobo seasoned chicken instead of pork for his al pastor and wrapping it in chicharrón de queso (an inventive way of saying crispy griddled cheese), pineapple habanero sauce, pickled onions, and guacamole. Check its calendar to find out where the truck is posted up today, or find it reliably every Tuesday at Quartyard Downtown. 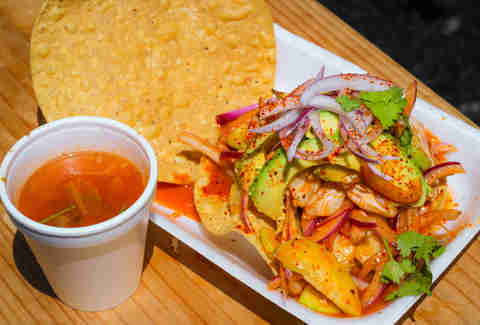 The chicken al pastor won Salt + Lime the Best Traditional Taco designation at The Reader’s 2016 Tacotopia festival, and truth be told, this is one unorthodox delight. With the right set of eyes, the Tostada Loca looks like a gruesome altar fashioned to spite Poseidon by sacrificing one of nearly every creature in his domain. This $12 monolith to the deep includes octopus, grilled shrimp, ceviched fish and shrimp, scallops, and sea snail covered in avocado, diced cucumber, tomato, onion, and cilantro. 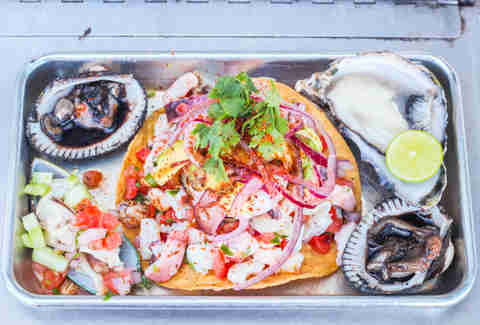 The tostada is served with a diced mussel and cucumber salad on the half shell, a raw oyster, and two patas de mula (formerly outlawed blood clams prized for their aphrodisiac properties). Top it all with German’s award-winning 7 Chiles salsa, a creamy sauce of four fresh and three dried chiles. Now here’s a treat. It’s everything we know and love about the surf & turf burrito but in the guise of a giant taco. Take a moment to appreciate just how beautiful this thing is. You’ve got juicy, marinated flank steak. You’ve got plump, grilled insects of the sea hiding coquettishly beneath chopped cilantro, tomato, onion, and avocado. You’ve got fresh corn tortillas oozing with melted cheese and a squiggle of cream sauce. What else do you need? WHAT ELSE COULD YOU POSSIBLY NEED?! Chad Deal is a tacoholic. Hello, @chaddeal.